Cancer Research Centre: Detection and Diagnosis of Lung cancer. 1. Chest X-Ray :- It is the foremost and the easiest diagnosis method for the detection of lung cancer though it is not so successful as it is sometimes unable to differentiate between cancer and puss in lungs. 2. CT scan or computerized tomography :- It also uses X-Rays along with a dye which is injected into lungs which gives the detailed computerized view of the chest area. 3. 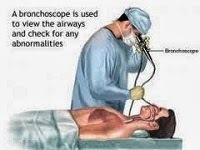 Bronchoscopy :- In this diagnoses method a thin tube is inserted through mouth to lungs to collect some cells of the lungs to examine. Its somewhat painful process but it is a quick method. 4. Lung Biopsy :- When lung cancer is detected then lung biopsy is done to find out which type of cancerous cells are there and further operations are performed after analyzing the tissue. 5. Bone scanning :- In bone scanning the nearby bones are scanned to check the extent of the cancer whether the cancer has spread to bones or not. 6. Sputum Cytology :- Sputum cytology is the process of examining a sample of sputum to check whether there is change in cells or not. If there is any change examined in the cells then further treatment is done.